The owner of the requester VPC sends a request to the owner of the accepter VPC to create the VPC peering connection. The accepter VPC can be owned by you, or another AWS account, and cannot have a CIDR block that overlaps with the requester VPC's CIDR block. The owner of the accepter VPC accepts the VPC peering connection request to activate the VPC peering connection. To enable the flow of traffic between the VPCs using private IP addresses, the owner of each VPC in the VPC peering connection must manually add a route to one or more of their VPC route tables that points to the IP address range of the other VPC (the peer VPC). If required, update the security group rules that are associated with your instance to ensure that traffic to and from the peer VPC is not restricted. If both VPCs are in the same region, you can reference a security group from the peer VPC as a source or destination for ingress or egress rules in your security group rules. By default, if instances on either side of a VPC peering connection address each other using a public DNS hostname, the hostname resolves to the instance's public IP address. To change this behavior, enable DNS hostname resolution for your VPC connection. After enabling DNS hostname resolution, if instances on either side of the VPC peering connection address each other using a public DNS hostname, the hostname resolves to the private IP address of the instance. For more information, see Working with VPC Peering Connections. A VPC peering connection goes through various stages starting from when the request is initiated. At each stage, there may be actions that you can take, and at the end of its lifecycle, the VPC peering connection remains visible in the Amazon VPC console and API or command line output for a period of time. Initiating-request: A request for a VPC peering connection has been initiated. At this stage, the peering connection may fail or may go to pending-acceptance. Failed: The request for the VPC peering connection has failed. During this state, it cannot be accepted, rejected, or deleted. The failed VPC peering connection remains visible to the requester for 2 hours. 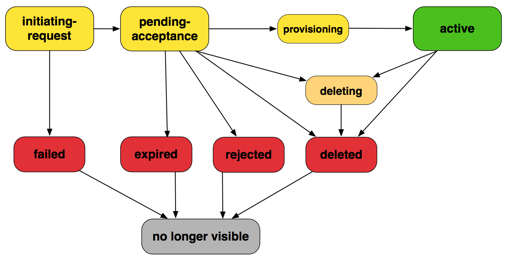 Pending-acceptance: The VPC peering connection request is awaiting acceptance from the owner of the accepter VPC. During this state, the owner of the requester VPC can delete the request, and the owner of the accepter VPC can accept or reject the request. If no action is taken on the request, it expires after 7 days. Expired: The VPC peering connection request has expired, and no action can be taken on it by either VPC owner. The expired VPC peering connection remains visible to both VPC owners for 2 days. Rejected: The owner of the accepter VPC has rejected a pending-acceptance VPC peering connection request. During this state, the request cannot be accepted. The rejected VPC peering connection remains visible to the owner of the requester VPC for 2 days, and visible to the owner of the accepter VPC for 2 hours. If the request was created within the same AWS account, the rejected request remains visible for 2 hours. Provisioning: The VPC peering connection request has been accepted, and will soon be in the active state. Active: The VPC peering connection is active, and traffic can flow between the VPCs (provided that your security groups and route tables allow the flow of traffic). During this state, either of the VPC owners can delete the VPC peering connection, but cannot reject it. If an event in a region in which a VPC resides prevents the flow of traffic, the status of the VPC peering connection remains Active. Deleting: Applies to an inter-region VPC peering connection that is in the process of being deleted. The owner of either VPC has submitted a request to delete an active VPC peering connection, or the owner of the requester VPC has submitted a request to delete a pending-acceptance VPC peering connection request. Deleted: An active VPC peering connection has been deleted by either of the VPC owners, or a pending-acceptance VPC peering connection request has been deleted by the owner of the requester VPC. During this state, the VPC peering connection cannot be accepted or rejected. The VPC peering connection remains visible to the party that deleted it for 2 hours, and visible to the other party for 2 days. If the VPC peering connection was created within the same AWS account, the deleted request remains visible for 2 hours. If the VPCs in the VPC peering connection are within the same region, the charges for transferring data within the VPC peering connection are the same as the charges for transferring data across Availability Zones. If the VPCs are in different regions, inter-region data transfer costs apply. You cannot create a VPC peering connection between VPCs that have matching or overlapping IPv4 or IPv6 CIDR blocks. Amazon always assigns your VPC a unique IPv6 CIDR block. If your IPv6 CIDR blocks are unique but your IPv4 blocks are not, you cannot create the peering connection. VPC peering does not support transitive peering relationships. In a VPC peering connection, your VPC does not have access to any other VPCs with which the peer VPC may be peered. This includes VPC peering connections that are established entirely within your own AWS account. For more information about unsupported peering relationships, see Unsupported VPC Peering Configurations. For examples of supported peering relationships, see VPC Peering Scenarios. 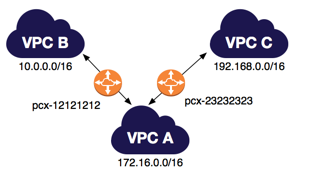 You cannot have more than one VPC peering connection between the same two VPCs at the same time. Unicast reverse path forwarding in VPC peering connections is not supported. For more information, see Routing for Response Traffic. If the VPCs are in the same region, you can enable the resources on either side of a VPC peering connection to communicate with each other over IPv6. IPv6 communication is not automatic. You must associate an IPv6 CIDR block with each VPC, enable the instances in the VPCs for IPv6 communication, and add routes to your route tables that route IPv6 traffic intended for the peer VPC to the VPC peering connection. For more information, see Your VPC and Subnets in the Amazon VPC User Guide. Any tags that you create for your VPC peering connection are only applied in the account or region in which you create them. If the IPv4 CIDR block of a VPC in a VPC peering connection falls outside of the private IPv4 address ranges specified by RFC 1918, private DNS hostnames for that VPC cannot be resolved to private IP addresses. To resolve private DNS hostnames to private IP addresses, you can enable DNS resolution support for the VPC peering connection. For more information, see Enabling DNS Resolution Support for a VPC Peering Connection. You cannot create a security group rule that references a peer VPC security group. You cannot enable support for an EC2-Classic instance that's linked to a VPC via ClassicLink to communicate with the peer VPC. Communication over IPv6 is not supported. The Maximum Transmission Unit (MTU) across the VPC peering connection is 1500 bytes (jumbo frames are not supported). You must enable DNS resolution support for the VPC peering connection to resolve private DNS hostnames of the peered VPC to private IP addresses, even if the IPv4 CIDR for the VPC falls into the private IPv4 address ranges specified by RFC 1918.